Retech Systems, LLC has been involved with the design, fabrication, and sales of cold wall induction melting systems for about 30 years. Over the past four years, Retech Systems, LLC together with Fluxtrol, Inc., has been evaluating the use of magnetic flux controllers to enhance electrical efficiency, power factor, and overall performance of the cold wall melting crucible. An open bottom, ten segment, water-cooled copper crucible was designed and built to include magnetic flux controllers. 55 mm diameter titanium alloy ingots were cast using either a 12 turn or a 14 turn induction coil with and without the use of magnetic flux controllers. Relevant tank circuit measurements were made to assess the electrical performance of each configuration. A 31% increase in casting rate was measured using magnetic flux controllers located in between the segments of the crucible and around the outer periphery of the induction coil. The increased power input available to the melt also resulted in a significant improvement in ingot surface finish, as determined by a qualitative examination. The induction melting process which uses a segmented, water-cooled copper crucible has been used for many years. This process is commonly referred to as Induction Skull Melting; however, it is also known as Cold Wall Induction Melting. Siemens and Halske Akt.-Ges. applied for a patent on the concept in November 1926 in Germany . Official German publication and issue dates were in January and February 1931, respectively. This patent primarily applied to difficult to melt metals such as tantalum, tungsten, thorium, and their alloys. Tir and Gubchenko  published (in Russian) an excellent book of induction melting of reactive metals. As described by Mühlbauer, et al. , recent developments of the process have been primarily for reactive metals such as titanium alloys, zirconium alloys, and silicon. Most, if not all, of the development work related to the process has occurred after the Second World War and has been largely driven by the need for high performance materials in the nuclear and aerospace industries. Within the last 15-20 years, applications have emerged related to silicon processing for photovoltaic applications as well as newer titanium alloy applications for the commercial automotive markets. Both of these markets are strongly driven by material and processing costs. As such, over the past four years Retech has been more fully investigating the design and operational characteristics of its cold wall induction melting systems. Soft magnetic composite (SMC) material provided by Fluxtrol, Inc. was designed into select locations of an open bottom cold wall induction crucible and the induction coil. 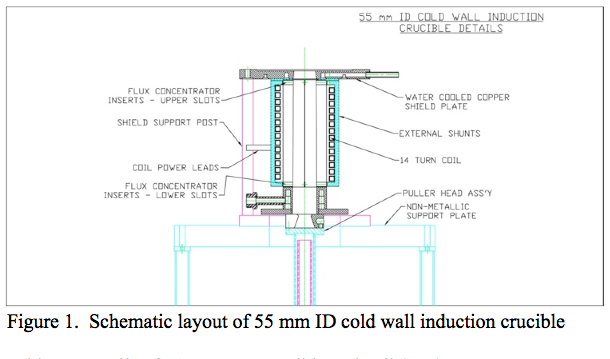 Figure 1 shows the details of the 55 mm inside diameter open bottom cold wall induction crucible. Three configurations were tested: 10 segment crucible and 12 turn coil; 10 segment crucible with SMC inserts in between each segment at the top and bottom of each slot and 12 turn coil; 10 segment crucible with SMC inserts in between each segment at the top and bottom of each slot and a 14 turn coil with external SMC shunts attached to the coil. The dimensions of the crucible and coil are shown in Table 1. Thermocouples and flow meters were installed in the cooling circuits of the crucible and coil for calorimetric measurements during melting. For an identical input power of 129 kW, a 31% increase in casting rate of 55 mm OD ingots was measured using magnetic flux concentrators located in between the segments of the crucible and around the outer periphery of a 14 turn induction coil. It must be noted that the crucible design (number of segments, H/D ratio, wall thickness, etc.) was not optimized. Further work will yield a crucible design with higher electrical efficiency. 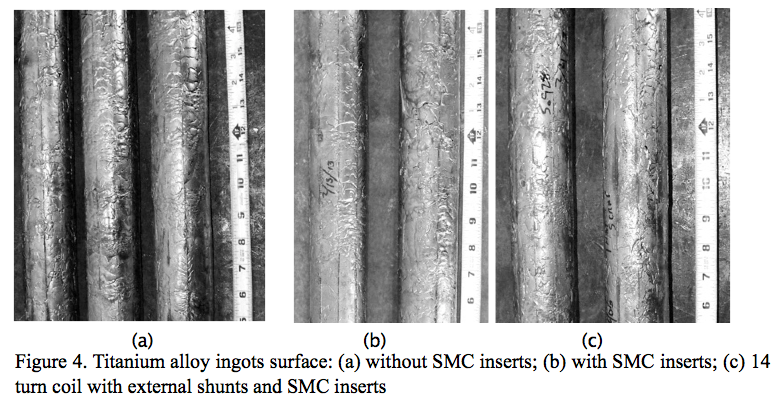 A qualitative examination of the ingot surface finish showed significant improvement. This was attributed to the increased power input to the melt within the crucible. The amount of power removed by the crucible was 72% during ingot casting and that removed by the coil was 12% of the input power. Further experimental work is needed to clarify the exact amount of power to the melt in the cold wall induction crucible. A better understanding is needed regarding the magneto-hydrodynamic forces developed during ingot melting and casting in an open bottom cold wall induction crucible. Retech and Fluxtrol plan to investigate this aspect further in order to optimize ingot surface finish. All of these factors will improve product yield and ultimately reduce the cost of producing small diameter titanium alloy ingots. German patent number 518499, Class 31C, Group 28, issued 16 February 1931 to Siemens & Halske Akt.-Ges in Berlin-Siemensstadt. Tir, L. and Gubchenko, A., (1988) Induction Melting Furnaces for Processes of High Accuracy and Cleaness, Moscow, Energoatomizdat, (in Russian). Muhlbauer, A., (2008). History of Induction Heating & Melting. Vulkan Verlag GmBH. Delage, D., Ernst, R., and Driole, J. (1982). “Induction melting in a cold crucible.” Proceedings of the Symposium of the International Union of Theoretical Applied Mechanics, Cambridge, UK, 108-118. Pericleous, K., Bojarevics, V., Harding, R.A., and Wickins, M. (2003). “Experimental and numerical study of the cold crucible melting process.” Proceedings of the Third International Conference on CFD in the Minerals and Process Industries, CSIRO, Melbourne, Australia 10-12 December 2003, 599-606. Umbrasko, A., Baake, E., and Nacke, B. (2008). “Numerical studies of the melting process in the induction furnace with cold crucible,” Compel, v27(2), 359-368. Nemkov V., Goldstein R., Kreter K., Jackowski J., (2013) “Modeling and Optimization of Cold Crucible Furnaces for Melting Metals,” Proceedings of the Int. Symposium HES-13, Padua, Italy . .S. Patent 3,775,091. November 1973, Clites, U.S. Bureau of Mines. U.S. Patent 4,838,933. 13 June 1989, Apparatus for Melting and Continuous Casting of Metal, the Process Involved and Use of the Apparatus, Paillere et al. Compagnie Europenne Du Zirconium CEZUS.